Disability-focused career guidelines for coaching kids at every developmental stage. These disability at work guides, all based on cerebral-palsy-career-builders.com content, are quick, rich resources for parents who seek to effectively career coach their youngsters with special needs. This resource directory includes 100 articles and 12 guides (in eBook, paperback and audio formats) -- all listed below by age group (elementary, middle school, high school, college and young job seeker). "7 Transformation Stories: Little Book 1 About Self-confidence for Parents of Elementary Students With Cerebral Palsy"
"Career Book 1: 17 Career-readiness Strategies for Parents of Elementary School Students With Special Needs"
"7 Transformation Stories: Little Book 2 About Disability's Edge for Parents of Middle School students With Cerebral Palsy"
"Career Book 2: 16 Career-readiness Strategies for Parents of Middle School Students With Special Needs"
"7 Transformation Stories: Little Book 3 About Reaching Out for Parents of High School Students With Cerebral Palsy"
"Career Book 3: 15 Career-readiness Strategies for Parents of High School Students With Special Needs"
"7 Transformation Stories: Little Book 4 About Emotional Intelligence for Parents of College Students With Cerebral Palsy"
"Career Book 4: 15 Career-readiness Strategies for Parents of College Students With Special Needs"
I also recommend EDsmart.org's "Winning in College: A Guide for Students with Disabilities," a guide which covers topics such as transitioning into college, recognizing the rights of students with disabilities, documenting disabilities, obtaining scholarships, choosing the right school and many other helpful resources for students with disabilities. 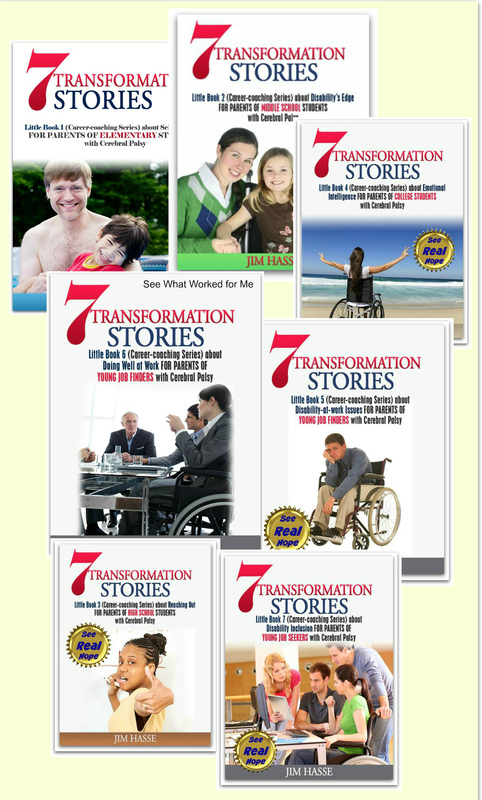 "7 Transformation Stories: Little Book 5 About Disability-at-work Issues for Parents of Job Finders With Cerebral Palsy"
"7 Transformation Stories: Little Book 6 About Doing Well at Work for Parents of Job Finders With Cerebral Palsy"
"7 Transformation Stories: Little Book 7 About Disability Inclusion for Parents of Job Seekers With Cerebral Palsy"
"Career Book 5: 16 Career-readiness Strategies for Parents of New Job Finders With Special Needs"